You can run a variety of reports on your fax transmissions and print your speed and group dial lists. 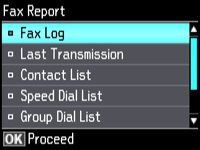 Note: You can also select to print a report automatically after a fax is sent by selecting Setup, then selecting Fax Settings > Send Settings > Last Transmission Report. Make sure you loaded letter-size or larger paper in your product. 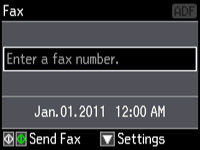 Press the left or right arrow button to select Fax, then press OK. Select one of the available reports, then press OK.
Press either of the buttons to print the report.